Physical education teachers from across the San Diego Unified School District (SDUSD) gathered for their annual back to school professional development day. Topics that were discussed were FITNESSGRAM, Best Practices, meeting the needs of all students and grade level collaboration time. 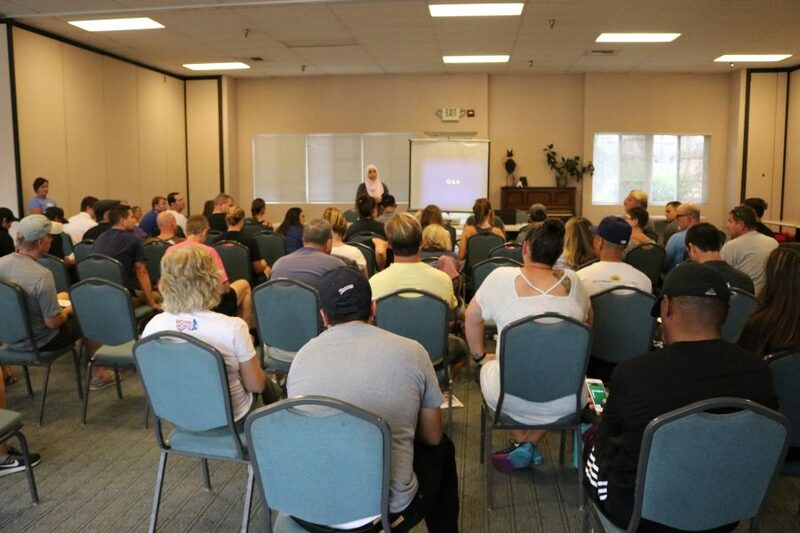 As a part of “meeting the needs of all students”, the event also engaged teachers from all grade levels on Improving Muslim Youth Participation in Physical Education and Physical Activity. Physical education (P.E.) teachers had expressed a need for some information to better serve their Muslim students. The purpose of this training was to educate SDUSD P.E. teachers how to accommodate the needs of Muslim girls while practicing their religious obligations, and a guide was also created to complement this training. The Muslim Practical Guide was designed to present the proper understanding of Islamic practices and identifying barriers for Muslim girls with physical activity. The Faith-Based Wellness Program began the implementation of this guide by presenting to the SDUSD P.E. educators at the training. In collaboration with the Islamic Centers Bureau, over 70 P.E. teachers attended this forum. The hour-long presentation was focused on the importance of physical health, gender equity and practicing modesty. After the presentation was completed, attendees completed a post-evaluation survey. Overall, the response to the guide was very positive and a step in the right direction towards promoting an all-encompassing environment for young girls to thrive and live a healthy lifestyle.